Easter is coming up this weekend and for dinner I’ll be serving one of BeeBop’s most favorite recipes ever, Deviled Eggs. Back when we used to have lots of kids in the house and big Easter egg hunts, I’d usually boil several dozen eggs for the little ones to color and for us to hide and them to hunt. I’d always cook extra boiled eggs so that we’d also have plenty for lunch as well. Because, of course, it just wouldn’t be Easter dinner with a few Deviled Eggs. Deviled Eggs, also known as stuffed eggs, Russian eggs, or dressed eggs, are simply hard-boiled eggs that have been peeled, cut in half, and stuffed with a filling made from the egg yolks mixed with other ingredients such as mayonnaise and mustard. They are generally served cold as a side dish for holidays or parties. Or just because it’s Thursday. The term “deviled” in reference to food was in use in the 18th century with the first known print reference appearing in 1786. In the 19th century, it began to be used most often with reference to spicy or zesty food, including eggs prepared with mustard, pepper or other ingredients stuffed into the yolk cavity. I make mine very simply with just a few staple ingredients. I know a lot of people add other ingredients, but these are what we like best. Hope you enjoy this very simple recipe for delicious Deviled Eggs. Boil, cool and peel the eggs. 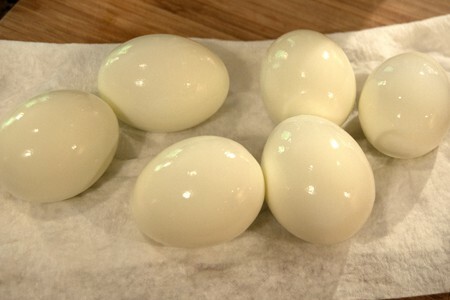 Slice each egg in half lengthwise and remove the yolks to a bowl. Mash the yolks with a fork. Add the mayonnaise, mustard, pickle relish, and salt and pepper to taste. Mix until well combined. Using a piping bag or a teaspoon, fill each egg white with the yolk mixture. Dust with paprika. Deviled eggs with a touch of mustard and sweet pickle relish. Boil, cool and peel the eggs. Slice each egg in half lengthwise and remove the yolks to a bowl. Mash the yolks with a fork. Add the mayonnaise, mustard, pickle relish, and salt and pepper to taste. Mix until well combined. Mmmm…before or after Easter, it doesn’t matter as long as you post it up. Yummy delicious deviled eggs. My entire troop loves deviled eggs. That is one thing I can count on there not being leftover after having dinner with them! I never thought of using curry powder in them, but I bet it’s great! I’m so going to do that next time. Deviled eggs and summertime go together in my mind like salt and pepper: a perfect match I keep experimenting with weird new variations — my husband suggested the addition of anchovies today (yuck!) — but keep coming back to a classic recipe like yours as the tried and true best. Just wonderful. Barbara, It seems that I’ve heard of someone else adding anchovies to deviled eggs. Or maybe placing one atop the finished egg. The flavor could be interesting. I love those little devils! I like them with sweet pickle relish too! I make mine with dill relish, dijon mustard and mild herbs such as Fines Herbs which is a mix of chervil, parsley, tarragon and chives. They are so different that they just disappear!! Best of all, nobody can quite put their finger on what makes them unusual. Also, a trick I learned was to put the deviled part in a ziploc bag for transit to the picnic or potluck. When you get there, all you have to do is clip the corner of the ziploc and pipe the goodies into the egg halves. That way, you don’t have to worry about everything getting all mushed up together during the ride. Great tip about traveling with deviled eggs! Also, some really interesting additions to the filling with the fines herbs, etc. Thanks for the great information, Tracey. a touch of mustard and a touch of horseradish! Such a pretty photo! I love deviled eggs, but for some odd reason, I’ve never made my own. Yours look simple and pretty perfect! This is one of my favorite of all time too! Makes me hungry looking at em. AND no carb (or extremely low carb). Your beautiful photograph is on the front page of Serious Eats right now. (In case you didn’t know). I love deviled eggs and we can do bar-b-q without having them. I have also put a small dollop of guacamole on top of each egg. Delicious. The guacamole sounds great! Yum. Exactly how my southern belle mother made them!!! I love reading your southern recipes. Instead of paprika I us cayenne pepper. Same color but more of a bite! I use the cooked egg yolks, mayo, mustard, a little finely chopped onion (either vidalia or green onions — with the green onions can sprinkle a little of extra green part on top), finely chopped celery, and dill pickle. Dang, now I want a couple!!!! I put 3oz of soften cream cheese it really gives it a great change. Also I have tried cheese spread the kids really like. I would never have thought of cream cheese in deviled eggs. I’ll have to give that a try! Mmmm Deviled eggs! I make them exactly like this. They are totally awesome! Thank goodness you add pickle relish. I married into a Yankee family and for 30 years I’ve had to cart my own relish to holiday meals to add to my deviled eggs! I make my deviled eggs the same way you do! I do add a few drops of Lea & Perrin’s sauce…. I just found your website on Pintrest…..I love your recipes…and pictures!! Try adding a heavy pinch of curry powder. It’s really great for a bit of a change-up! Great idea, Janine. I’ll try that! I use the same recipe but I like mine with a little twang to it. I put a little vinegar and some cayenne pepper to spice it up a notch!! That vinegar and cayenne sure sounds good, Dee! I’m going to try that next time I make these. I use salt/pepper, dill, grated onion, yellow mustard, Hellman’s Mayo (aka Best Foods), sometimes a bit of cayenne pepper (if the crowd is a tad younger), and after filling the whites again, I sprinkle paprika and stick a tiny square slice of carrot in the top. Folks have been favorably commenting on that bit of crunch. My deviled eggs are asked for everytime I am invited to a get-together. Well, so, too, is my fried cauliflower! Oh yum!! oops. I forgot to mention the addition of parsley!! I use a straner and smash the egg yoke through the size you use to sift flour with, it really makes the filling creamy. That’s a great idea, Louise! I’ll remember to do that next time. Your recipe is identical to mine – 2 great minds! Others I’ve heard use pickle juice w/o the relish but we like the relish tang. I also add finely chopped onion. I wonder if a dash or 2 of Tabasco would enliven them, but how can you improve on perfection?! I sacrifice a whole chopped boiled egg to the yellow to give more filling to the halves. Also, I boil the eggs and then when they are rolling for a short few seconds, I remove the pot from the heat. Let sit for about 20 minutes. Drain and run under cold water and let sit in some ice water until cooled. If you tap the ends of the eggs and let sit in the cold water, it seeps in and helps loosen the shell. When ready to peel, I roll the egg on the counter until all the shell is in tiny pieces on the egg. Then I peel under cold water. That seems to help avoid the eggs from being shredded by the shell. Also, using eggs not newly purchased is supposed to help in peeling. Thanks for the recipe and reminder. I was just wondering what to take to the family Independence Day Celebration! …plus, I sprinkle smoked paprika on the egg tops. Am I the only one who also adds in real bacon bits or crumbled crispy bacon to the yolk mix? I don’t Joleen, but it sounds really delicious! I add horseradish to my deviled eggs. Delish!!! I’m from Georgia and I have never made deviled eggs without onions.. To me, and everyone that I know from the south, say’s that they are just not southern made deviled eggs without them. Everything else in this recipe is perfect though..
Isn’t that funny? I’m from Georgia, too, and I’ve never had deviled eggs *with* onions. Nobody I know puts onions in theirs, either. Interesting how recipes differ from place to place. I’ve lived in north Georgia and south Georgia and never had onions in deviled eggs. Never had pickle in deviled eggs in north Georgia. Our deviled eggs were mostly egg. My late SIL put a pimento-stuffed olive slice atop hers. I would not be opposed to ripe olives in or on my deviled eggs. I haven’t used onion in mine either, Jean, but I’d try it. another ingredient that is delicious is deviled eggs is horseradish. Really gives them a kick! I don’t use relish in mine, but I do use pureed Vidalia onion, and push the yolk thru a strainer, I also use half honey mustard & half yellow mustard. Hi Lana, Happy Easter! I’m not a big egg eater, so when my son was a child and wanted Deviled Eggs I found a way to make them so that I could eat them. No mustard, no pickles in eggs( I love both ). I use equal amounts of mayo(Hellman’s) and sour cream, salt, white pepper, onion powder, dash or 2 of garlic powder and dill weed(fresh or dried). I use dill weed on top/sometimes chives/and real bacon crumbled is delicious. I would love if you would try it. Spices are to taste- just be sure to use enough. They never last long! This is exactly the recipe I have been making since 1967….My family always wanted me to bring the deviled eggs and the potato salad to every family get together…. I use the ziplock bag when transporting, too, and always freeze the egg plate before using it. Another nice touch is to top with either the traditional paprika and/or a slice of olive. And drat! Now I’m hungry for some! I use a sandwich bag to “squirt the yolks back into the shell. my girlfriend adds bacon and uses miracle whip instead of mayo but the bacon is so yum in the eggs!! ALL of your recipes and other variations are great! thank you so much!! Happy Easter!! Sometimes the spices are too strong for me in sweet relish, so I usually use minced baby kosher dill pickles. I also like using Miracle Whip. And I really like the idea of using a zip lock bag to “squirt” the filling into the egg halves. I am going to try that next time! Perfect. Can’t improve on perfection. I just love deviled eggs. Always have. I like to make extra so that I can use the leftovers to make egg salad. One trick that I picked up for egg salad is to grate the eggs. That is supposed to be the way that they do it at Augusta National for those traditional marvelous egg salad sandwiches. Give it a try! That’s a good idea! I’m going to try it next time. Family loves deviled eggs so when ever the eggs are requested I am normally the one who makes them which means I end up boiling 3 doz. eggs to please the family. I do add just a bit of Dijon mustard in mine along with the yellow mustard. and adding just a ‘pinch’ of curry powder makes for a nice touch. I think my mama puts a little curry powder in hers. It’s very good!